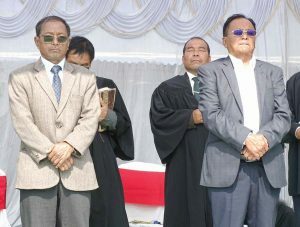 The new chairman of NSCN (IM) Q Tuccu (right) and Tongmeth Wangnao, the vice-president. Dimapur, Feb. 11 (EMN): Putting all speculations to rest, the NSCN-IM on Monday appointed Qhehezu Tuccu its chairman or ‘yaruiwo’; while Tongmeth Wangnao was appointed its vice-chairman. The posts of the chairman and the vice-chairman have been lying vacant since the demise of late Isak Chishi Swu and ‘gen. (retd. )’ Khole. According to the statement, prior to their being elected to the new positions, Tuccu and Wangnao were both members of the NSCN (IM) collective leadership. Tuccu was born on Feb. 20, 1945 and joined the Naga national service in 1980. He hails from Nihoto village in Dimapur. Beginning from 1982 as acting chairman, UT, the updates informed, Tuccu has held various posts in the capacity of ‘kilonser as Chaplee, Keya Affairs, Forest & Environment and Mines & Minerals, and as member of the steering committee.’ He was made a member of the collective leadership in 2013. On the other hand, Wangnao joined the Naga national service in 1987. Till 1995, he was serving as secretary before being elected Tatar in 1995. The statement mentioned that starting from 1998, Wangnao has held important posts in the capacity of kilonser like Chaplee, Kilo, Education, MIP, as Speaker, Tatar Hoho, member of the steering committee, and NJB convener. He was also made member of the collective leadership in 2013. Muivah stated that many nations have perished with the passage of time. However, ‘the Nagas took the decision to be for Christ and thus sustained our existence. God will not be pleased if we deviate our ways from the decision taken by our elders with tears and blood,’ the updates mentioned Muivah as saying. Muivah further urged the members to take strong stand to adhere to the principles followed by former chairman, late Isak Chishi Swu, who declared unity of the Nagas in the name of Jesus Christ.